Bosse Heating & Air Conditioning LLC offers a wide variety of central air conditioning services in Southington, CT and surrounding towns. New high efficiency central air conditioning systems offer considerably enhanced cooling and dehumidification as well as significantly reduce operating costs. Whether you are replacing an existing central air conditioning system or adding a new central air conditioning system, Bosse Heating & Air Conditioning LLC has several high efficiency models to choose from. We also offer free consultations. With over 50 combined years of technical HVAC experience, our team of experts uses the latest and most accurate technical tools to ensure that your central air conditioning system is working to its’ fullest potential. We carry a variety of air conditioning systems, such as split systems, self contained AC systems and mini split air conditioning systems. 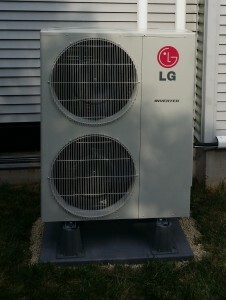 Ductless mini-split AC units are great for small spaces, while offering high efficiency at an affordable rate. Upgrading your system can improve your comfort level, cut the cost of your utility bill and save you money on repair bills. Our air conditioning repair services are available year-round and we carry replacement parts for most central air models. We offer a wide selection of air conditioning systems that are affordable to purchase and economic to run. Bosse Heating & Air Conditioning LLC provides central air conditioning services throughout Central Connecticut including Southington, Plainville, Bristol, Meriden and Cheshire.